Tear up the hard-packed terrain with this dry terrain-specific Terreno Gravel tire from Vittoria. Featuring a new take on the file tread pattern, this stepped scale center patch rolls fast over hard-packed terrain while still offering superior traction for traction and cornering. Transitional mid and side tread allow this tire to dig in and grip the terrain as you dive into corners and bends. Dry condition-specific tread pattern features scaled center tread and transitional mid and side tread. This is definetly a tire for drier conditions, but I would say it's execeptional in this category. The center tread pattern is an improvement over tradition file treads. I believe this tire has better traction and lower rolling resistance than your typical file tread. The shoulder knobs are great while cornering and for off cambers. The ride feel is somewhat supple, not on par with tubulars. What it lacks in supplness I think it will make up for in durability. I am running this tire on a Stan's Valor rim. In the 33mm size the tire measures 35mm on the Valor rim. About average effort to mount tubeless. I use stan's sealant. Zero problems with burping, or losing pressure over night. No flats through 5 cx races and several gravel rides. I weigh 175 and have run the tires 3230 psi. on dry hard course and 3028 on dry grass courses. Be Cautious Of Sharp Objects. Thin side Walls. My Rear tire only lasted a week, the I received a large gash from a sharp Rock and had to put a tube in the tire as I was running tubeless, the tires roll great and grip really well but those side walls are not meant for riding around Rocks or Trails with mixed terrain, I think it's more of a racing tire, I'm really bummed. I have tried dozens of tires on my Steve Potts gravel grinder. 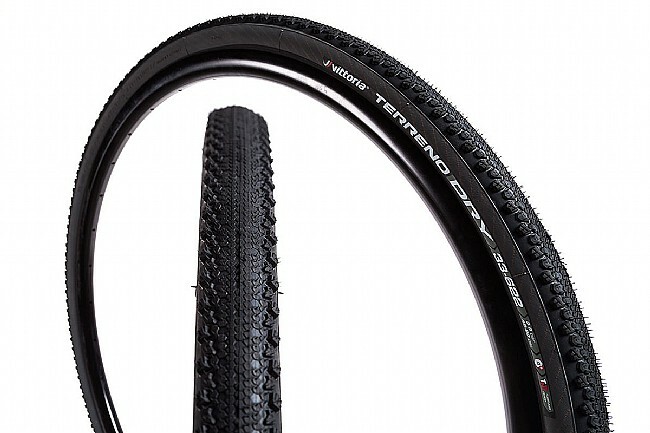 This is the perfect tire for mixed surface use. Fast & quiet on pavement with great cornering traction (even at 30mph downhill on pavement). Plenty of traction on fire roads & single track. Also, the best sealing tubeless tire I've used so far (loses less than 5 psi per week). I've been on the hunt for the elusive fast-rolling mixed-tread tubeless gravel tire. I've ridden a small handful of options. The Terreno Dry rolls great on all surfaces, corners reasonably well on gravel but finds its limit when climbing out of the saddle on graveldirt. It just does not have the tread to offer full traction when out of the saddle in loose conditions. It set up tubeless without any trouble and has proven to hold pressure great. They size true their 40c spec, though the sidewall says 38c. The rear tire is showing considerable wear at about 700 miles ridden. It's been a great tire for mixed rides where road leads to graveldirt. You can do better for full graveldirt use.